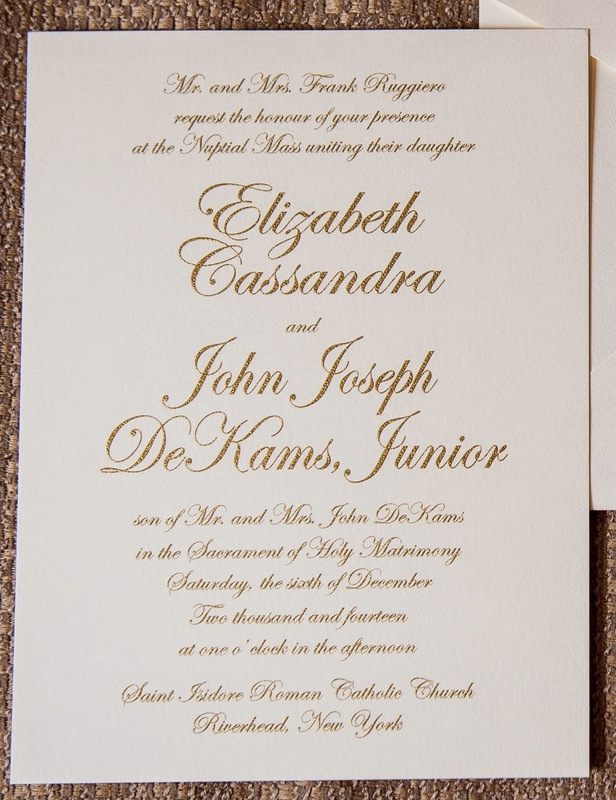 For Elizabeth and John’s Christmas wedding in Riverhead, New York, the bride knew exactly what she wanted when it came to wedding invitations, all the way down to the font and wording. 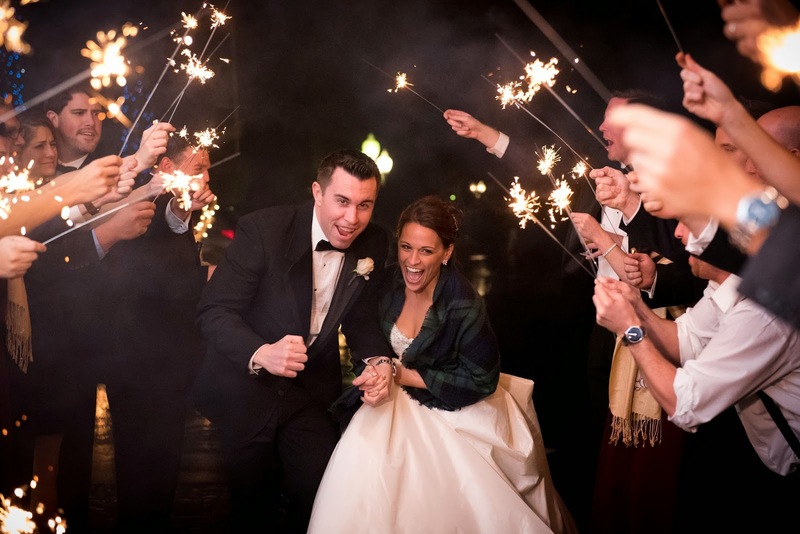 She worked with the staff at Manhasset’s Inklinations to create an invitation that would set the tone for their “traditional with a splash of modern” wedding, which came complete with jingle bells, carols and even a little Metallica. Tell us how you and your fiance met, and how did he propose? John and I both attended the State University of New York at New Paltz. Being on the swim team and John being on the baseball team, we had been friends for about four years and decided to start dating each other two weeks before graduation. John proposed at the William Hill Estate Winery in Napa Valley, California on Friday, June 28, 2013. The sun was setting over the beautiful, picturesque landscape and John found it to be the perfect moment to get down on his knee and ask me to marry him. I agreed. I wanted a traditional wedding suite that complimented our "traditional with a splash of modern" wedding. We were also planning a Christmas wedding with rich burgundy and gold tones, so I planned to incorporate this in some way. I quickly decided on the gold thermography on ecru paper. 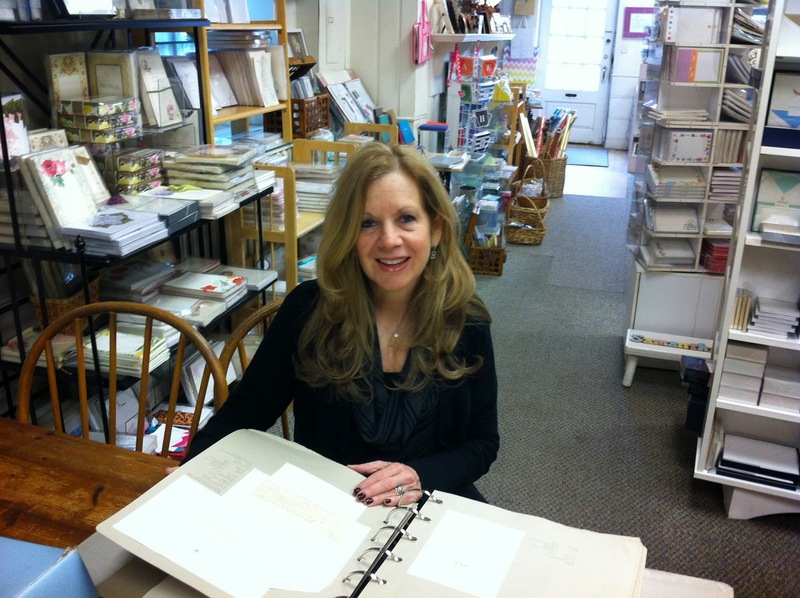 I worked with Anne at Inklinations in Manhasset, NY. I wanted traditional wording and she assisted with the etiquette. I loved that the suite was traditional and timeless. It could be seen as an upgrade to a wedding that took place 50 years ago—it will never go out of style. We had out names done on two lines and large size font, so they both stood out and added a modern flair, I was not crazy about excess empty space! I knew I was going to be picky about the invitations. I grew up in a family that favored correct grammar, punctuation and etiquette. It was necessary to cross every T and dot every I with this choice! The invitation, like the dress, sets the tone for the wedding. Your wedding should reflect you as a couple, and all these choices you make throughout the planning process come together to set that perfect tone. Every couple is different, so decide the wedding you want to have and let it be a reflection of you as a couple. Uniqueness sets your wedding apart from others. Our Christmas wedding was everything we had imagined and planned for! We were married at St. Isidore Roman Catholic Church in Riverhead, New York and our reception was held at Giorgio's at Fox Hill in Baiting Hollow, New York. Our 225 guests enjoyed the festive Christmas decor throughout the venue, listened to Frank Sinatra Christmas carols while they ate dinner, danced the night away to our fantastic band—Peat Moss and the Fertilizers—and rang clusters of jingle bells as they requested us to kiss. I can't single out a specific favorite moment—there were so many throughout the day! John and I are both New York Yankees fans, so our band performed a phenomenal rendition of "Enter Sandman" by Metallica as we made our grand entrance into the ballroom. This moment is definitely a close second to marrying my best friend. It was truly a perfect Christmas wedding. Most brides come in with some kind of idea of the type of invitation they want. They may mention traditional, classy elegant, modern, pockets, simple, etc. Elizabeth came to us knowing not only the look she wanted but also exactly how the invitation itself should look. In fact, she even came in with a printed mock up showing font, font size and layout. It took a few proofs and a change of font before the invitation was approved for printing. Naturally, the first question we ask is where and when the wedding will take place. We will ask her if they’ve sent out a save the date card or are interested in doing so. We will ask her if there is a particular “look” she has in mind. Does she have any colors she wants to incorporate or type styles she likes. We will also tell the bride about our full range of calligraphy services (hand or machine) we offer for envelope addressing and place cards. Finally, we will let her know that we can also help her with menus, programs and thank you notes. There is an increased interest to incorporate specific color schemes on the invitations that will coordinate with the bridesmaids’ dresses and/or flowers. 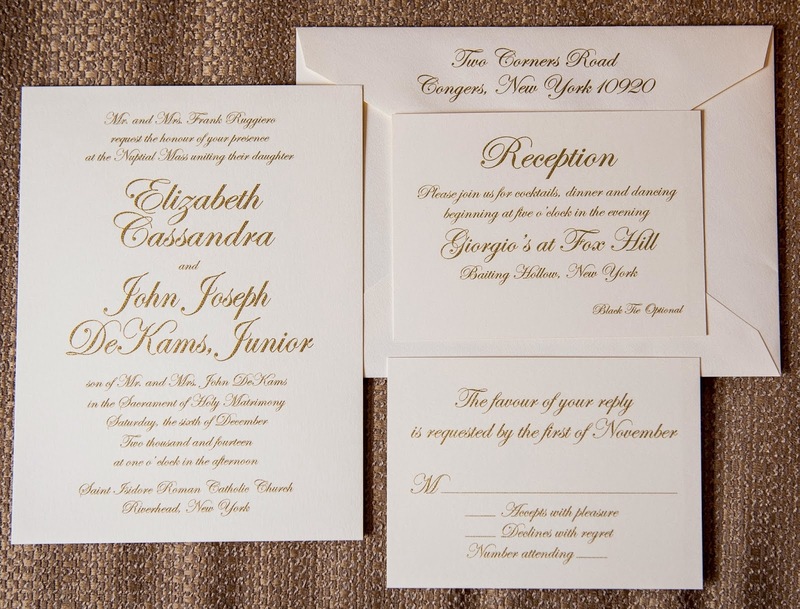 Also, most brides want to mix print and script fonts and they often prefer a flourished script for their names. Foil lettering and edge painting are becoming more popular. The only advice we can give when a bride calls to make an appointment is to make sure she allots sufficient time to browse through all the books. There is really no advice we can give until we’ve been able to spend some time with her and get an idea of what she is looking for. Due to the internet, brides are much more versed in invitation styles and vendors. It’s now very common for a bride to note something she has seen on the internet or even on a specific vendor’s website. There is more interest in color, foil and letterpress invitations. Single envelopes are more popular now than double.